Who says you need to go to the fast food centers to enjoy a pizza? No one! 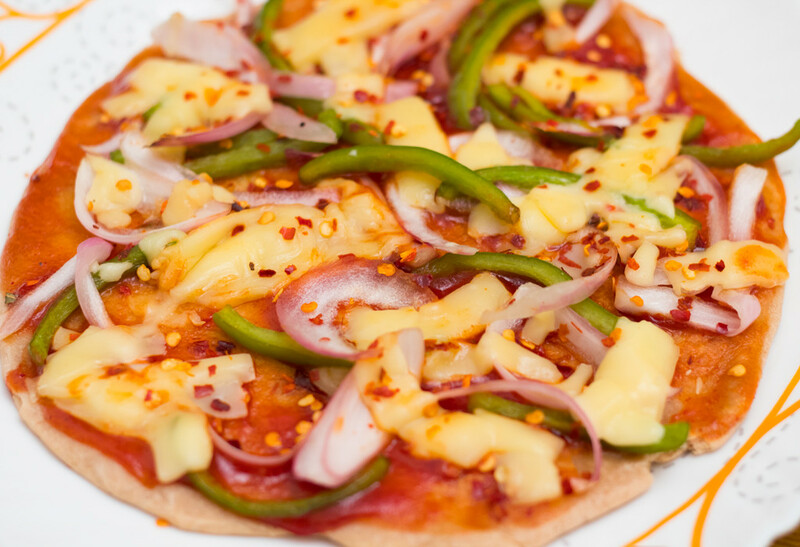 If you love pizzas, then take time to prepare this simple and easy pizza recipe - and guess what- it can be made right on the stove top. So, no complaining about hot ovens also! Here is our take on Easy Pizza Recipe that needs just a hot flat pan and absolutely no oven! Take large bowl, add wheat flour, all purpose flour. baking powder, baking soda, sugar, butter, curd and salt and mix well. Then pour water and knead to form a dough. Rub a little oil on the dough and leave to rest for 30 minutes. Now pour oil in a pan, and once hot, add onions and capsicum and saute for 2 minutes and keep aside. Mix in chilli flakes and cover well. Now take a small portion of the dough and roll out to get a flat base. Take a tawa that is going to be used to cook the pizza and use that size as a guideline to roll out the dough. The dough base should not be too thinly rolled out. Heat the tawa, add a little oil and place the base onto it. Once the bottom side is cooked, flip over and then you can assemble the toppings. Spread tomato sauce, then the vegetables, and then cover and let it cook for 5 minutes on low heat. Finally sprinkle a little cheese and cover so that the cheese melts a bit. Take off from heat, slice into wedges and serve hot. Your Easy Pizza Recipe with no oven is ready in a matter of minutes. This is a basic recipe, but you can always add cottage cheese cubes or baby corn and make the pizza more appetizing.